Dine in style with the Arlington Dining Chair Beige Fabric, a comfortable dining chair with a timeless, elegant look. Fit for a variety of settings, from the dining room to the bedroom, the Arlington is a fashionable multi-purpose piece with plenty of potential. 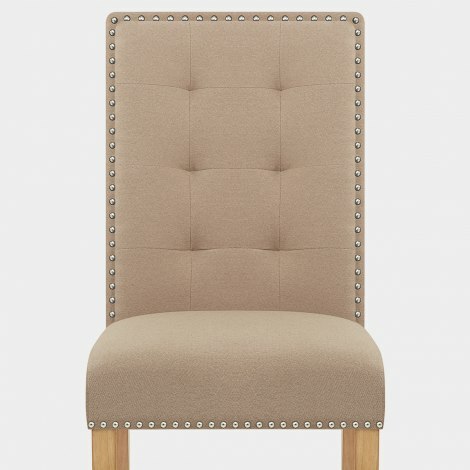 Undeniably luxurious, it is upholstered with plush beige fabric and edged with studs for a classic finish. 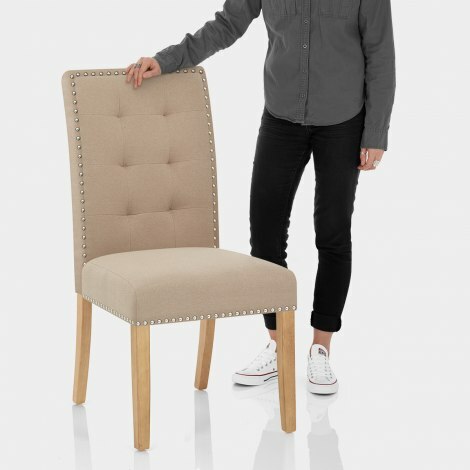 Its tall, supportive backrest features quilted detailing, enhancing both the comfort and appearance of this deluxe model. Plus, the sumptuous seat is sprung and belted for premium comfort. 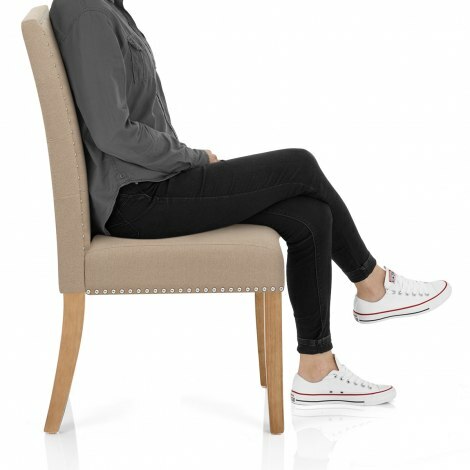 Four oak finished legs support the seat, formed of solid wood for strength and stability. The Arlington comes complete with protective floor plugs, helping to ensure flooring remains in excellent condition. "Excellent quality and extremely well made"
Having looked in local shops, and despairing of ever getting 4 dining chairs to suit my table without costing the earth, I found Atlantic Shopping. The Arlington chairs could have been bespoke for my table! They are perfect, excellent quality and extremely well made. The price is amazing, and delivery to Belfast was two days - absolutely first class. I cannot recommend this company highly enough, and will be back to purchase any future furniture needs. Very pleased with chairs - they are excellent quality. Excellent service in the show room and the delivery very pleased with the chairs. This is the second time I have purchased chairs from Atlantic Shopping and it will not be the last! Customer service is excellent and the same can be said for delivery, quality of the chairs and price. I have received many compliments about my chairs and told them all about you! Many thanks!